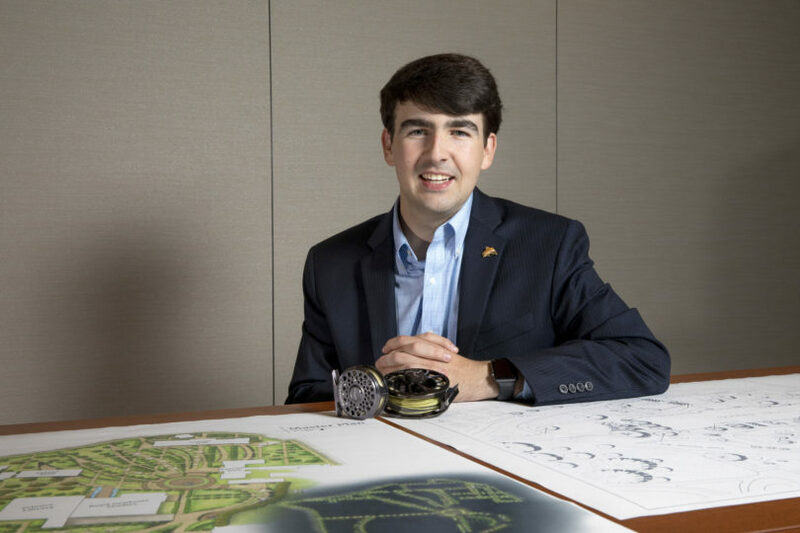 Braden Meadows is passionate about helping people, and as a landscape architecture student he wants to impact people’s experiences with their surroundings in the best way possible. And when he’s not in the classroom, you might find him fly fishing in a North Georgia stream. The Cultural Landscape Laboratory at UGA and real estate assistant in Watkinsville, Georgia. My grandfather graduated from UGA in 1963 and currently I have two cousins that attend here; however, my whole family cheers for the Dawgs! A tenet that I have always held is that the key to a successful and fulfilling education is through active participation. This statement is what has guided me through the past few years at the University of Georgia. My time at UGA has been one that has continually evolved – revealing to me the fields that I am passionate about and the strengths (and weaknesses) that I possess. Throughout my freshman year, I had intentions of pursuing a career in medicine and as a result became involved in research within my first month at UGA. I was fortunate to meet and gain many insights from Paul Xie and the Computational Drug Discovery Laboratory. Under Dr. Xie’s guidance, I conducted research, using 3D computer visualizations, on microtubule stabilization and their role in the field of cancer treatment. While, ultimately, I decided against pursuing a career in medicine, Dr. Xie and my fellow researchers revealed to me that one of my strengths was using technology and dimensional thinking in solving problems. Fast forward to the latter part of my freshman year, and I am sitting in associate professor David Spooner’s “Intro to Landscape Architecture” course and realize from the first day that this is where my strengths and passions combine. After a meeting and tour with associate professor Brad Davis and Rose Tahash, I knew that the College of Environment + Design was going to be my base for the next three years. Starting my sophomore year, this could not have been truer and, as a result, I have met some of the most talented professors at UGA and made some of my closest friends. As I progressed through my first year in the CE+D, I realized that I wanted to somehow combine my passion of responsible, effective and efficient land planning with public service. As my second semester in the CE+D came to a close, I applied and received an internship with a Georgia congressman in the United States House of Representatives. (I know what you’re thinking – what business does a landscape architect have in Congress? You are not alone.) In my internship, I was able to tailor my daily experiences to closely follow policy related to the House committees on Natural Resources, Financial Services, and Transportation and Infrastructure. All this policy, at the end of the day, had one unifying element – a landscape architect is either instrumental in the implementation of it or one is going to be affected by it in professional practice. This experience led me to realize that at the core of my passion in landscape architecture – one thing holds true. I want to impact people’s experiences with their surroundings in the best way possible – whether that be designing the land-use ventures of tomorrow or advising on legislation that alleviates the stresses of modern housing issues. Finally to the present – this year is, arguably, my busiest year yet. After my first year was complete in the CE+D and I had a grasp on the strengths and needs of my college – I became involved in being a representative of my college. I currently am a student ambassador tasked with providing representation at official functions such as first-year BLA orientation, group studio visits, prospective student outreach and Commencement. Along with being a student ambassador, I am also my college’s senator to the Student Government Association where I serve on the Sustainability Committee. Just recently, I have been working on an initiative to find funding and provide support in the installation of a water bottle refilling station in my college. This task is one that has introduced me to many of the amazing people in the CE+D’s administration and other offices across UGA’s campus. I also provide student representation for the CE+D to the University Council. To keep a close connection with my peers at all levels of my college, I am involved with the Georgia Students of Landscape Architecture, the Student Historic Preservation Organization, and the LAbash 2019 Executive Committee. In GSLA, I serve in an advisory position working with the current leadership to help advance any of their initiatives through my role in SGA. LAbash 2019 is a student-run national landscape architecture conference that is coming to Athens in 2019. To help with the preparations for this event, I serve on the sponsorship committee to seek out academic and corporate sponsors to help fund the conference. In addition to my social involvement in the CE+D, I just recently began working in the Cultural Landscapes Laboratory with associate professor Cari Goetcheus. In this role, I have the amazing opportunity to see, firsthand, how cultural landscapes, that range in scale from a two-acre homestead up to a national park, are documented, analyzed and provided recommendations for future treatments. Aside from my involvement with the academic side of UGA, I am a past officer and the current president of Costa/Trout Unlimited 5Rivers Fly Fishing Club at UGA. This is a fly-fishing, stream conservation, and general student body outreach organization. In this position, I am able to combine my passions in landscape architecture with my love for the sport of fly-fishing. We invest heavily in the Athens community whether it be through educational events or stream cleanups – the core mission of our club is to promote a strong conservation ethic while enjoying the recreational opportunities that North Georgia has to offer! … of the endless opportunities that graduates are afforded, the respect that is commanded from the degree, and the community that you become so invested in. The day I first set foot on the campus in high school, I knew this was where I wanted to go to college. The sense of camaraderie among students and the time-honored traditions all proved to be too much of a draw compared to the other schools on my list. As I weighed my options in the latter half of my senior year, I couldn’t help but take note of the benefits of in-state tuition and the Zell Miller Scholarship! I have two favorites that top my list. First, I love walking around UGA’s North Campus with friends. The quads coupled with the surrounding buildings, the Arch, and the easy access to downtown provide a nice, easy-going atmosphere that allows you to get a handle on what you have to get done. Most every morning, I will take the Orbit Bus from the intramural fields to the Arch bus stop and make a point to walk through North Campus on my way to the Jackson Street Building for my first class. Second, I love going to the UGA Creamery. Ice cream is, by far, my favorite dessert and the Creamery provides the fix whatever the weather outside is like. Free time is a rather rare occurrence during the semester, but when it does occur I am usually well on my way to somewhere in the mountains (or to Atlanta) to go fly-fishing. Being knee deep in a gently-tumbling stream or watching the fog rise off the river is one activity I can always count on to ease stress and provide relaxation. Athens is an ideal spot for this activity as it is in proximity to numerous resources that provide a full-range of outdoor experiences. I am the owner and head guide of small fly-fishing guide service that provides trips all over North Georgia. That being said, I wanted to expand my offerings to provide float-trips out of western style drift boats. After securing the necessary funds and the even harder task of convincing my parents, I decided to purchase a drift boat with one caveat – it was in Idaho. When I told my parents of this fine detail, I received a blank stare that was followed by a surprising response from my dad. He said, “How long does it take to drive to Idaho?” I responded, “Oh, just a couple of hours – without any traffic around 29.” With a little coercing, I convinced my dad to make the trip out there and back in the four-day period of time that I was available to do it in. If you’re doing the math, 60 percent of our time on the trip was spent in the car. We shift drove the entire way out and the entire way back and witnessed Mother Nature at her finest. Our trip out to Idaho provided beautiful weather as we passed through the heart of our country; however, our luck ran out as soon as we hitched up my boat. As we were pulling out of the boat manufacturer’s warehouse, we knew it was going to be a long trip when on the radio they said a late spring snow storm was coming through the Rockies. As we drove through Idaho, the snow was consistently coming down but not sticking to the roads – yet. Once we got into Utah and traversed the area just outside of Arches National Park, we arrived at the little town of Monticello. We stopped at the only service station we had seen for miles and swapped shifts – it was now my turn. Being from North Georgia and of a family that buys milk and bread when snow is forecast – I know the least about driving in snow. No sooner than we left the city limits of Monticello did we enter the heaviest snow I had ever seen. The snow quickly accumulated, and we were driving, without another soul on the road, in 5 inches of snow with a drift boat behind us. I have never prayed harder for a snow plow or tractor trailer in my life – and to my wish a tractor trailer pulls out in front of us loaded down with hay bails that pushes all of the snow out of its tracks. We followed him for the entire way from Monticello, Utah, to Albuquerque, New Mexico. When we finally pulled into our driveway at home, I no sooner got out of the car and went straight to bed. This was, hands-down, the craziest, most eventful, and all-round good time that I have ever had. In a short four-day period, I was able to witness the most rural, rugged and beautiful landscape that I had ever seen. … depends on what it is that I am studying. If it is for a test or to write a paper, I love to just be in my room at home where it is quiet so that I can concentrate. When this isn’t possible, the Owens Library in the Jackson Street Building is another great choice. When I am working on a studio project, I love being in the studios at the JSB. Here I can focus on the project at hand and constantly get feedback from my peers. There is also plenty of fun that is had during breaks! This is the toughest question yet. I will try to narrow it down to three – with one taking the top spot. I, however, would be remiss if I didn’t express my sincere gratitude to people like associate professor David Spooner, associate professor Brad Davis, Rose Tahash, Tom Jones, Melissa Tufts, associate professor David Nichols, associate professor Brian LaHaie, associate professor Wayde Brown, and professor James Reap for being so committed to helping all students with their professional and personal development as they progress through the CE+D. In my first semester in the CE+D, I had the pleasure of having associate professor Jose Buitrago and associate professor Ashley Steffens. Professor Buitrago’s continual critiques of my projects helped me to acquire a design vocabulary along with a better understanding of how a person experiences a space. Professor Buitrago strives every day to make sure that each student receives feedback and has the skillset that is necessary to be successful in our future – whatever that may be. He, also, made the 8 a.m. studios that much more bearable with his quick wit and unique sense of humor. Concurrently, I had professor Steffens for “Design Communications I – Hand Graphics.” This was the course I was most nervous about because I struggled drawing a stick figure coming into it. Professor Steffens is a leader in her field and provides personalized instruction that accommodates students at every skill level. A testament to her success as an instructor is the progress I made from drawing stick figures to waiting on some of my graphics to be published in a book chapter and an industry-trade magazine. What makes professor Steffens one of my favorite professors, however is the compassion she has for her students. Knowing that it is our first semester in the BLA program, she is constantly asking the class how our projects are going and if there is anything she can do to alleviate some of our stress. The one day that I will never forget was the morning our first project was due. We were all in class, hanging on by a thread, after working tirelessly on our project when she walks in and asks for students to help her get something out of her car. She had taken the time before our class to go to Panera and get us breakfast to celebrate the completion of our first project. It was actions like these that cemented her as one of my most impactful professors. Finally, my favorite professor at UGA has been Cari Goetcheus. I have taken a class with professor Goetcheus every semester that I have been in the CE+D and I have not lost interest in any of their subject matters – in fact I only have inquired more. Professor Goetcheus is an industry leader in the field of cultural landscapes and has a reputation that stretches far beyond the University of Georgia. Her classes provide thought-provoking questions that make one really delve into the breadth of factors that affect landscape use and development. One of my favorite aspects of professor Goetcheus is her endless pursuit to push her students’ work to the next level and challenge them with tasks that have real-world applications. Granted, she expects a lot and then some from her students; however, the knowledge she instills is valuable to anyone regardless of their background or career choice. Most importantly however, she is just as good of mentor as she is a professor. The adeptness and candor with which she gives advice regarding career choices or topics to research makes her one of the first places that I stop when I seek this advice. As a student of landscape architecture, a sense and understanding of space have become paramount to anywhere I go. A person that understood this fully, analyzed it thoroughly, and then manipulated it masterfully was Walt Disney. Walt Disney had the keen and unique ability to provide people with experiences that last a lifetime. Many people can place a point in time when a Disney entity has affected them in one way or another. This distinct and memorable moment revolves around Disney’s capability to “tell a story.” Story is not just an animated cartoon. The story is carrying a person through an area without them realizing that it is changing around them – they are ingrained. Along with his adept story-telling ability, Disney had the additional quality of being business and technology savvy. This combination of skillsets is something that does not come together often and is a goal that I try to emulate daily. If I could spend the afternoon with Mr. Disney, I would ask him these questions along with about a hundred more as a fraction of his talent would make any career or design exceptional. … love to be the secretary of the interior. I have always had a deep interest in the public lands and the natural and historic resources that are spread across the country. With my education in landscape architecture, historic preservation, and my intrigue with public policy – this would be one of my dream jobs. The United States’ public lands are pulled in every direction, depending on the issue, and I think as an advocate for public ownership with a mindfulness of industries – this job would prove to be a challenge that I could not begin to fathom. The incessant trials that this job would entail are what draw me to the task even more. … go to as many countries that I could over the course of a year. I have always been drawn to things that are international, whether that be politics, architecture, landscape architecture or places my faith holds sacred. Taking a year, I would love to go and spend time in many of these locations interacting with the people, experiencing the sites, and absorbing as much as possible. I would make sure to intermix a variety sites with a slight emphasis on landscapes – large and small. Helping people. A quote that I live by and try to implement in all of my endeavors is by Will Smith: “If you’re not making someone else’s life better, then you’re wasting your time. Your life will become better by making other lives better.” I think passion is something so much larger than a career choice as it is something evident far outside of the classroom or workplace. My passion of helping people can be found whether I’m on the jobsite, volunteering with my church, teaching Boy Scouts how to fly fish, or just simply hanging out with my friends. The underlying similarity is that the more I help people, the more I am driven to find new ways to do so. After senior year, I plan to enroll in a law school program and/or a graduate degree program in landscape architecture. It has been my goal the last few years to combine these two fields in a way that satiates my love of land planning with my interest at its intersection of public policy. … the night before classes started my freshman year. It is during this time that I made a lot of the friends that I am still extremely close with and a time when so many things came together. It was during this time that I first experienced the classes, waited in anticipation for the first football game, and continually kept meeting new people. In the years since, I have had some amazing times here at UGA that are unforgettable in their own rights, but none of them stand close to this period of a few days!